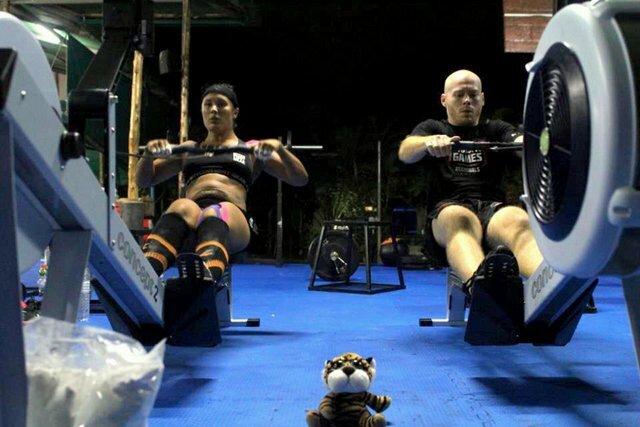 PHUKET: Past the halfway point of their 24-hour workout marathon, Ryan Jones and Kitty Teppo are trying to catch some sleep with little success. First photo: Ryan Jones prepares for the workout. Second photo: Kitty Teppo and Ryan Jones in action. In Phuket, Saturday nights are reserved for nightlife but Jones and Teppo are working out – a lot. 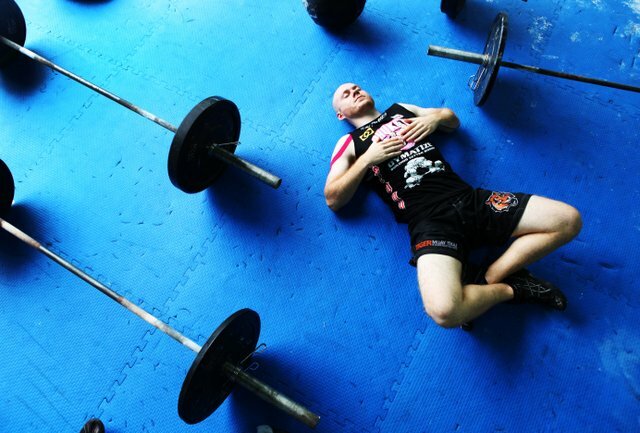 Tiger Muay Thai and MMA Training Camp (TMT) was the site of the island’s first ever “24-Hour CrossFit for Tigers Challenge” recently. The event, which helped raise awareness on the plight of endangered tigers, challenged the participants to perform one workout, every hour, for 24-straight hours starting at 3pm and ending the same time a day later. About B30,000 was raised for charities dedicated to rescuing tigers that were orphaned as a result of over hunting in north Thailand. “A friend of mine came up with the idea and Jones and I thought it would be really cool to do it for charity, to push ourselves,” Teppo, who grew up in Finland, said. The duo gathered support from local businesses willing to donate funds and supplies, including Phuket Pro-Nutrition, InkAsia Thailand, and Powerhouse Fitness. TMT’s own Chef, Miles Norris, fuelled up the participants throughout the challenge, which included everything from burpees to Olympic lifts to backward runs and sit-ups, all done at an intense level. Jones and Teppo planned each workout about a month in advance, deliberately adding exercises that were a point of weakness for them. The duo prepared their bodies with training at TMT and a proper nutrition plan. Each workout lasted anywhere between five to 30-minutes, all done at high intensity. Raising awareness on the overhunting of tigers seemed like the logical choice as both participants are animal lovers that wanted to help restore the endangered Indochinese and Malayan tigers, of which there are only 500 left in the world. During the early part of the challenge, Jones was feeling ecstatic – he had just finished his seventh straight workout and riding an endorphin high. By midnight, the feeling began to fade as fatigue settled in, the duo were creeping to their breaking point. Exercising through the night, Teppo and Jones had their music blasting, electrolytes flowing, and friends stopping by to give words of encouragement. “It was motivating to see people watching us and then donate into the collection box afterwards. It helped our confidence a lot,” Jones said. Still, the duo were tired and by 4.25am, they had just finished their 13th-straight workout – a series of 500 metre rows with 400 metre runs. “It’s for the tigers” Jones mumbled to himself as he closed his eyes. Only 11 workouts left, the duo pressed on, for the tigers.